Sometimes even familiar places can be breathtaking and so it has been in Glen Feshie and on the Moine Mhor over the last three days. 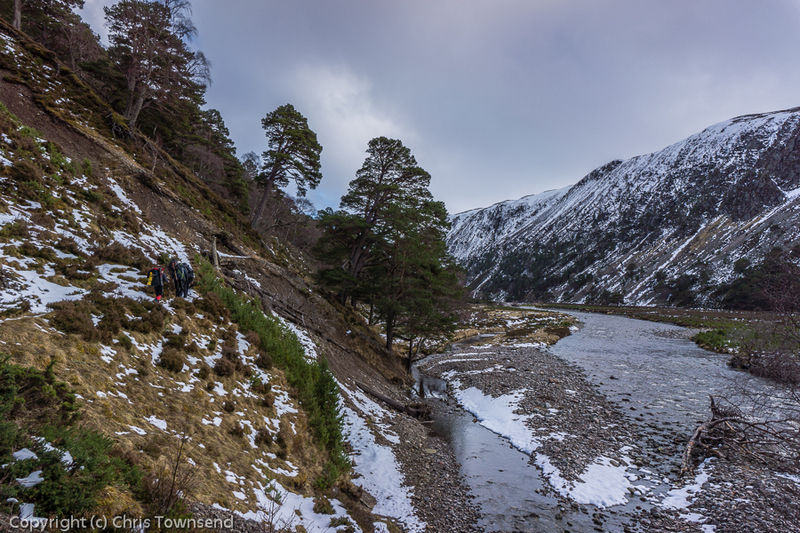 I was in Glen Feshie for more work with Terry Abraham on the Cairngorms In Winter film. Terry had already been there for a couple of nights when I met him on a sunny day that down in the forest felt more like spring than winter. We wandered up the glen admiring the ancient pinewoods and the braided rushing river before camping in the forest between the steep craggy slopes of Creag na Gaibhre and Creag na Caillich. Going down to the river for water we were surprised to see that the long thin waterfalls tumbling down Creag na Caillich were frozen into delicate traceries of silvery ice. There was thick ice on the edges of the river and round rocks out in the water too. At one point where the river slowed the ice had almost spread from bank to bank with just a narrow stream still running free. There was no feeling of spring here. That night we watched the stars come out in the black sky as the trees turned to silhouettes. Then the world lightened again as the moon, almost full, rose and cast pale shadows, turning the forest into a magical, mysterious wonderland. I fell asleep with the tent door wide open, wanting to remain in contact with this beautiful world. Dawn came in slowly, the sun touching the tops of the crags long before it reached the floor of the deep glen. 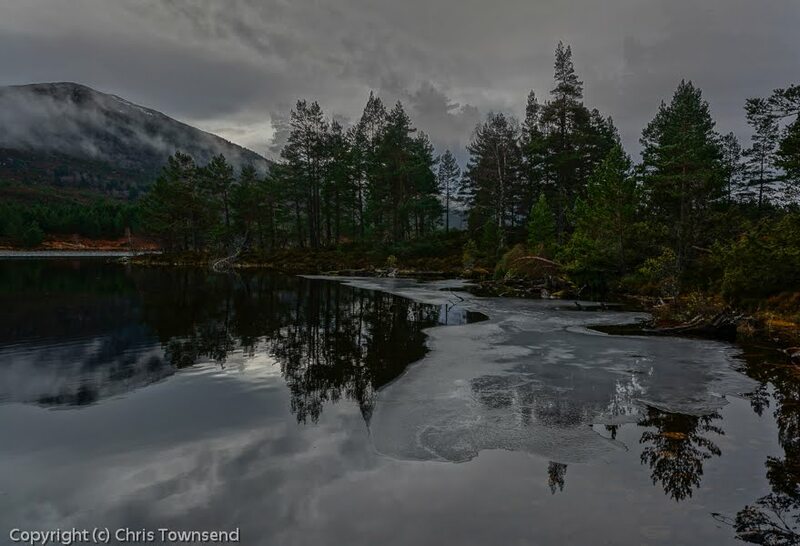 The temperature was still below freezing – the overnight low had been -4ºC. After a few hours filming and photographing we returned down the glen for the track up Mullach Clach a’Bhlair, the big hill on the south-west corner of the Moine Mhor plateau. The ascent began in the sunny warmth of the woods but finished in a strong cold wind on crusty snow. On the summit though the wind faded and we could look out across a huge panorama of the Highlands stretching out on all sides, a glorious vista. The light was sharp and clear, the sky an Alpine blue. We camped just below the summit. The situation was glorious and the evening light cast long shadows across the snow and picked out the shapes of the hills. The sunset was a red line across the western sky as the snow turned pink in the last rays of the sinking sun. Again there was a wondrous starry sky, this time brilliant from horizon to horizon with no trees to break up the constellations. Then the moon rose, dark red as it crested the horizon then fading both in colour and, apparently, in size as it rose into the night. My tent door remained open again and I fell asleep watching the stars and the shimmering moonlight. Although we were 600 metres higher than the camp in the forest and without the shelter of the trees the overnight low was again -4ºC. We were up before the dawn to watch the sky turn a brilliant red and orange over distant Lochnagar before the sun rose, turning the snow pink. Out to the north-west a pale moon sank slowly behind Creag Meagaidh with the air around it glowing a dull red. There was no wind yet also no frost or condensation inside the tents. The air was dry. Soon we could feel the heat of the sun. We crossed the vast icy expanse of the Moine Mhor to the tiny cairn of Sgor Gaoith perched high above frozen Loch Einich with the massive bulk of Braeriach rising above it. The white rolling plateau really had a feel of the arctic. On Sgor Gaoith I left Terry, who was spending one more night in the hills, and descended back down from the snow into the glen, where the hot sun was blazing down. The three days, and especially the two nights, had been majestic, awe-inspiring, tremendous – there are no superlatives adequate. 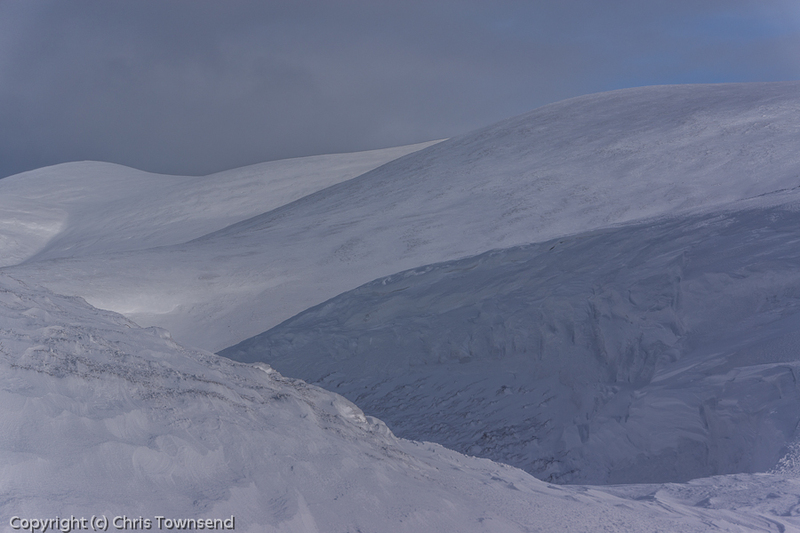 Certainly this had been one of the finest trips of the many I have made in the Cairngorms. This piece first appeared in TGO magazine a few years ago. As a few people have reacted with horror at the idea of winter camping, as described in my last post, I thought I'd post this to explain, maybe, why winter camping is wonderful. Laura and Guy Waterman. Backwoods Ethics. Just the thought of winter backpacking, of heading into the hills in the cold and frost and ice makes some people shudder, including many summer backpackers. The idea that winter backpacking means hiking through blizzards, pitching tents with freezing fingers and shivering through long dark nights appears masochistic to the inexperienced. And winter backpacking can indeed be uncomfortable, unpleasant and even dangerous. But with the right skills and equipment it can also be wonderful and exciting with no need for numb fingers or cold nights. The world is different in winter and so is the backpacking experience. The winter landscape is wilder and more dramatic. The hills seem bigger and more mountainous, especially when snow-covered. Packs are heavier but there is less time to walk so less time spent carrying the extra weight. Short daylight hours mean time has to be measured carefully. Off at dawn, camp at dusk. Maybe start or finish in the dark, walking by torchlight or, ideally, moonlight. When it’s clear winter skies are brighter, vaster and have a depth lacking in summer. When it’s stormy the shelter of the tent is even more appreciated. With fifteen or sixteen hours of darkness a winter night in a tent can be strangely relaxing. There is no need to hurry. Meals can be simmered slowly, books read, journals written, the sky watched. The sounds of the winter wild can be listened to – ice cracking, snow softly brushing the tent, the wind whistling down the valley. (The last is the reason I don’t listen to music or a radio in the tent – I might miss something important like the start of a snowfall or the wind beginning to build). Long hours in a warm sleeping bag (and it must be warm!) are a way to unwind and feel refreshed. There’s no early sun to wake you nor do you have to close the tent up to keep the midges out. I leave my tent open far more in winter than summer, relying on sleeping bag and clothing to keep me warm. Often I use a floorless single-skin tent or a tarp, something I never do in the insect season. I love being warm and comfortable under cover yet still able to look out at the world and not have to seal myself inside to keep the midges out. January is a better month for wild camping than August! The perfect winter landscape for backpacking is snow-covered, a pristine white alpine or arctic world where all signs of humanity are buried. Of course in Britain winter days are as likely to bring rain and sleet as snow and grey damp skies rather than the brightness of sun on snowfields. Warmer temperatures might seem preferable to the inexperienced winter backpacker and less demanding to deal with than freezing cold. This is not so. Wind and rain and damp air in above freezing temperatures can be more difficult to cope with than snow and sub zero temperatures. Keeping warm when it’s dry and -5 is easier than keeping warm when it’s wet and +5. Dampness is a real enemy in winter and why winter backpacking in Britain can be more challenging and difficult than in countries with colder winters. Even when the temperatures are below freezing there is still often no snow. Then the frozen icy world, the landscape bound hard as iron by frost, can be beautiful and demanding at the same time. Some of my most memorable winter backpacking trips have been in conditions like this. 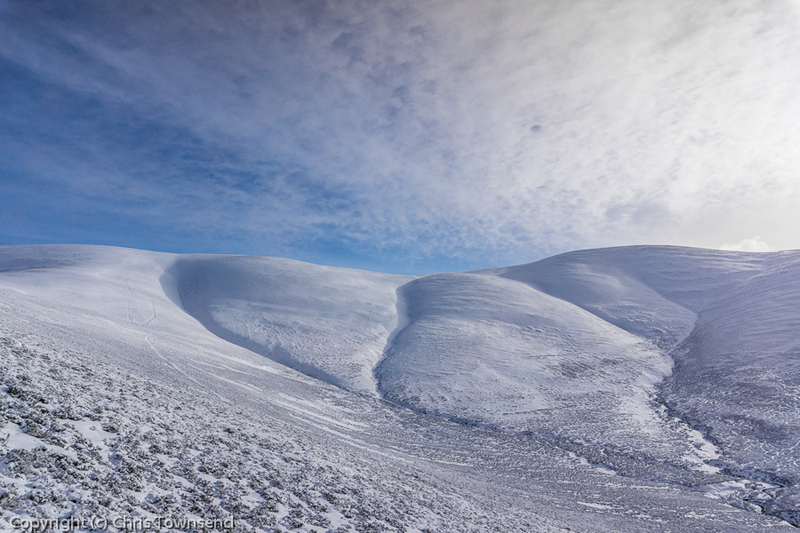 Two years ago in late December I headed into the Coulin Forest hills above Achnashellach in cold, clear weather. The hills were sharply etched against the blue sky and the sun gave little warmth. The path was a ribbon of rock solid frozen earth interspersed with patches of ice. As the low sun sank towards the horizon shaded Fuar Tholl and Sgorr Ruadh became monstrous black cliffs hanging over me. Across the glen Beinn Liath Mhor glowed red in the sunshine. 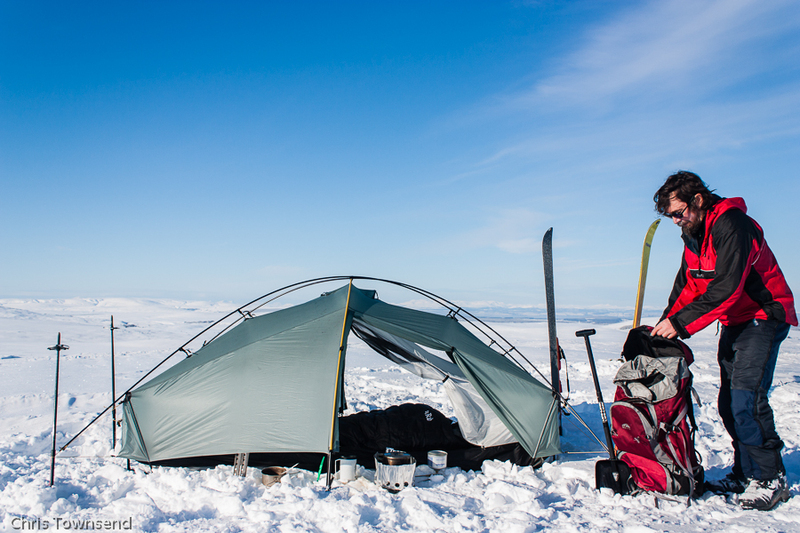 I camped on a col at 650 metres where I had to hammer my tent pegs into the frozen soil with rocks. 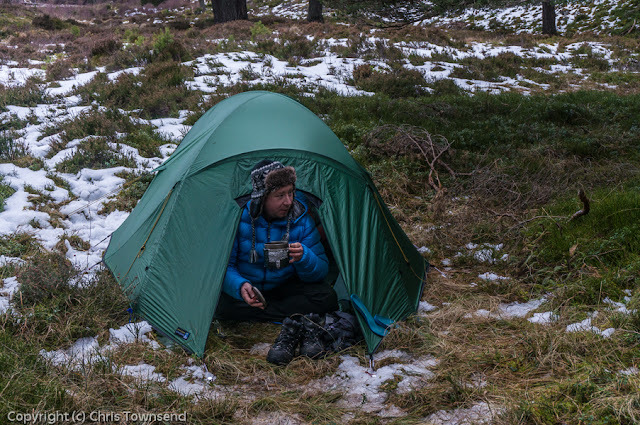 The temperature was -5ºC and a cool breeze made it feel much colder so I was glad to slide into my sleeping bag, light my little gas lantern and start the stove for a warming drink. There was no sound but the occasional sigh of the wind and no lights but mine. All I could see was mountain and sky. A half moon hung high in the black sky and the stars were brilliant. The great constellation of Orion, a symbol of winter backpacking for me as it’s not visible in the summer sky, rose between the black silhouettes of Beinn Liath Mhor and Sgorr Ruadh. The next day I climbed those two peaks, looking down on cloud-filled glens out of which the mountains rose stark and majestic while the mist flowed like water, pouring over the lips of corries. The going needed care as there was much ice – frozen streams and puddles, bubbles of ice in the grass where water had overflowed, a thin veneer of ice on rocks. The concentration needed to walk safely heightened the intensity of a breathtaking day of sunshine and astounding air clarity with sharp, distant views. Sitting on the summits in the faint warmth of the winter sun I looked across at the snowless Torridon summits etched hard against the pale blue chilly sky. There was no snow but it was definitely winter and definitely memorable. Such perfect weather is to be relished but not expected. 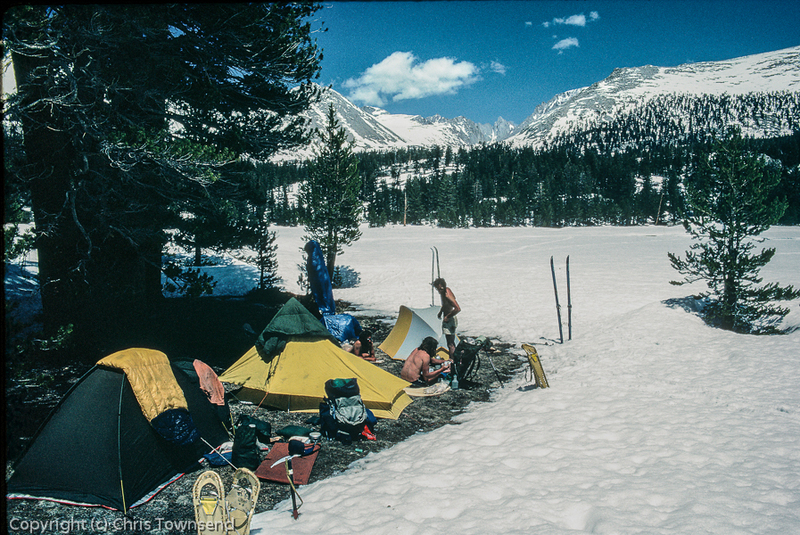 Many times the real joy in winter backpacking is making camp and getting out of the damp cold air. Such was the case in December 2008 when I hiked through the Gaick Pass with Cameron McNeish. Low cloud covered the hills and cold rain fell intermittently. Underfoot slushy snow made the walking hard. Everything was damp and grey. In the heart of the pass steep slopes vanished into mist and the lochans were half-frozen. We walked into the dusk and camped after dark on a frosty patch of grass. During the night the rain turned to wet snow then returned to drizzle at dawn. But our camp was peaceful and warm and the dull dampness ceased to matter as I lay in my sleeping bag cooking, eating and reading. Why would I have wanted to be anywhere else? 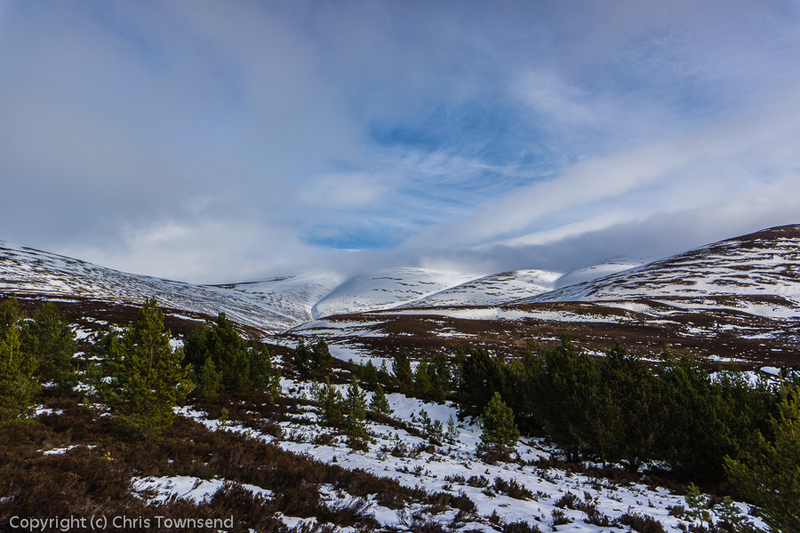 Clouds were racing over the summits and a cold east wind swept over us as we left the shelter of the forest in Glen Feshie and continued up the path in Coire Fhearnagan towards the mist-capped snowy slopes of Carn Ban Mor. Our intention was a high camp on the Moine Mhor, a vast rolling mountain plateau, which Terry Abraham wanted to film for the Cairngorms in Winter video. The forecast was for the wind to lessen during the day and for clear skies the next morning. We could only hope it was correct. We reached the snowline just as the slopes steepened for the final climb. In the first big snowbank just off the path a party were digging snowholes. The bank provided a briefer shelter for us as we took the opportunity for a break and to don more clothes out of the wind. Then it was onto the hard, rutted, old snow, refrozen since the last thaw. If there hadn’t been many deep boot prints, kicked when the snow was softer, crampons would have been useful. As it was we simply used the platforms made by others. The wind was fierce now, blasting down the slopes into our faces. At times it was hard to struggle into the gusts. As the slopes eased on the shoulder of Carn Ban Mor the cloud swept over us and the light became flat, making it hard to distinguish features ahead or even, at times, whether the snow immediately in front went up or down. Not bothering with the summit – a slight raise on a rounded bump – we were soon starting the gentle descent towards the head of Gleann Einich. A faint edge in the snow had me slowing down and peering hard. There was a drop of some sort in front of us. I edged round it carefully. Soon we could see it was the shallow gully of the Allt Sgairnich, parts of the sides of which were banked up into cornices. There wasn’t far to fall but walking over one of those would have been an unpleasant surprise. Out on the arctic-like expanse of the Moine Mhor we dropped just below the clouds, which we could see tearing across the sky over Braeriach – a sight that soon inspired Terry into some time-lapse filming – and shrouding Sgor Gaoith. Close to the lip of the steep craggy slopes running down to Loch Einich we found a splendid situation for a camp on some patches of flat snow. The crusted sugary snow wasn’t easy to pitch the tents on though as pegs quickly pulled out even when buried horizontally. Even wide snow pegs had to be stamped firmly down. I utilised my ice axe and trekking poles as secure pegs, finding when I thrust them in that the snow was at least two feet deep. Tents pitched we watched the faint pink glow of a mostly hidden sunset then retreated to the warmth of our shelters. The temperature was -5º but the wind made it feel much colder when we were outside. Snow melted and dinner eaten I quickly fell asleep only to be woken a few hours later by a stronger wind rattling the tent. I knew I could quieten it at least a little by going out and tightening some of the guylines but that meant getting dressed and venturing out into the bitter wind. I was warm and comfortable in my sleeping bag and had no fear of the shelter failing so stayed put, half-dozing and then, when the wind grew noisier, reading for an hour or so. (Having recently downloaded the complete works of Charles Dickens to my Kindle I browsed through this, settling on his description of days of storms during his voyage to America from his travel book American Notes – the thought of a severe storm at sea certainly put a bit of wind in the Cairngorms into context). Eventually I drifted back to sleep to be woken many hours later by the guttural calls of ptarmigan close to the tent. The sky was lightening with the dawn but when I looked out the clouds were still down on the summits and only to the north was there any sign of a clear sky. The wind had lessened but still felt sharp and stinging on the skin. The temperature was back to -5ºC. Overnight it had fallen to -8. I melted some snow and made coffee and muesli porridge. Terry braved the cold and came out to film me lying in my sleeping bag, eating breakfast and talking about the geological information on the back of the excellent Harvey British Mountain Map of the Cairngorms and Lochnagar, which showed that we were camped on glacial moraines on a big wedge of metamorphic rock that lay between the rockier granites of Sgor Gaoith and Braeriach. Whilst Terry was filming a golden eagle floated high overhead and disappeared into the crags above Loch Einich. Not long afterwards we saw it again, heading south., mighty and magnificent, a true symbol of the wild. The filming over I had no excuse to stay in bed any longer so donning all the clothing I’d been warming in the sleeping bag I ventured outside. The difference was immediate as the cold wind bit into me. With the tops still hidden we decided to pack up and return the way we’d come. 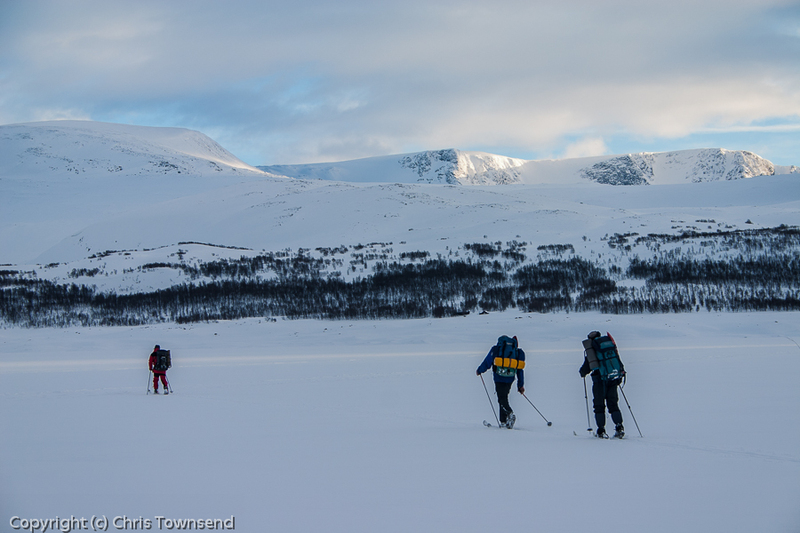 A high winter camp had been the aim of the trip and we’d achieved that. Shining in the bright sunlight the Cairngorms looked magnificent. After weeks of storms the weather had finally calmed down. This was an opportunity Terry Abraham and I had been waiting for – conditions that meant we could film a crossing of the Cairngorm Plateau to Ben Macdui and show the landscape in all its glory for the Cairngorms in Winter film. After days of thawing the snow had refrozen and the surface was hard and rutted. Terry soon donned crampons. He would keep them on all day. I was on skis but on the steepest part of the ascent I’d have preferred crampons as my climbing skins kept slipping and I had to traverse back and forth using the steel edges of the skis for grip. Once on the Cairngorm Plateau the view was sharp and bright, the air having an Alpine clarity unusual here, especially in February. Sunburn rather than hypothermia or wind chill was the biggest risk. There was no wind and the sun’s rays bounced upwards off the glazed snow, blindingly bright. Dark glasses were essential to cope with the glare. 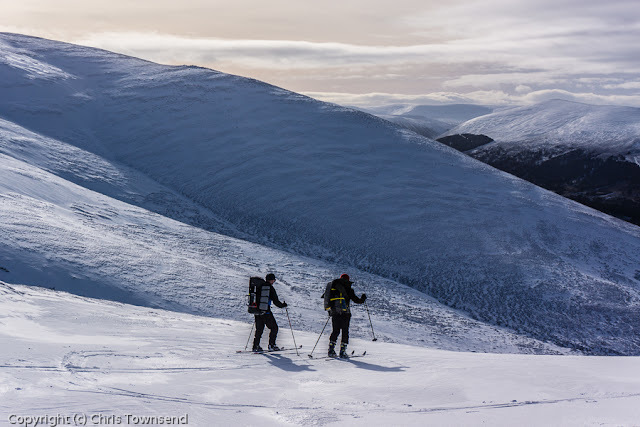 Along the rim of the Northern Corries many people were about – hill walkers, climbers coiling their ropes, skiers skittering and skidding over the icy snow. Once we turned away towards Ben Macdui the numbers dwindled rapidly. We met a few returning across the Plateau but there was no-one on the summit. We had the tremendous view to ourselves. Wandering down a short way south from the top we gazed down the great valley of the upper River Dee slicing between the Cairngorm sentinels of Cairn a’Mhaim and The Devil’s Point and beyond to rolling snowy hills reaching out to Beinn a’Ghlo. As we left the summit in the late afternoon the first pinkish glow was already appearing over the western hills as the sun dropped towards the horizon. By the time we were starting our descent the sky was on fire over the ragged line of distant summits. Terry descended the western shoulder of Coire Lochain, a good route for walkers but too rocky for skiing. I went down wide Lurcher’s Gully as darkness fell, clattering over the now rock-hard, bone-shaking snow. For the second time I thought that crampons and walking might be preferable. The jarring descent was challenging at night but soon enough I was linking snow patches across the moor that led to the car park and then, when there was more bare ground than snow, finally removing my skis, switching on my headlamp and walking. Soon I came upon Terry and we finished the day tired but content. Next, a high level camp. 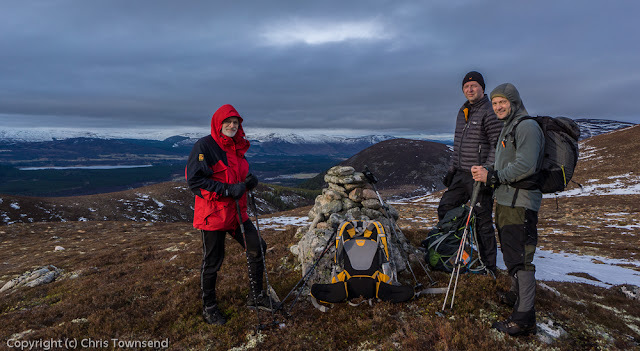 For the latest Cairngorms in Winter filming trip Terry Abraham and I were joined by three of our Kickstarter supporters for an overnight trip in Glen Feshie. I met John, Phil and Paul in the Mountain Café in Aviemore for a quick coffee before we set off for Glen Feshie and a meeting with Terry at the Ruigh Aiteachan bothy. 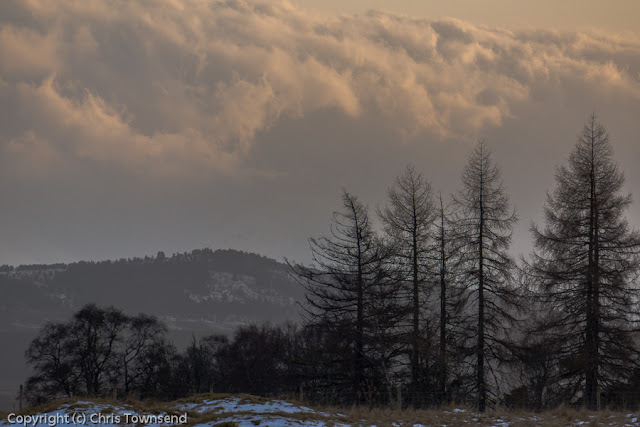 The weather was warm for February with low clouds on the tops and a continuing thaw. The paths in the glen were wet with mud and the last slushy snow. The side streams were less full than I expected though and we were able to cross on stones with no more than splashes of water getting into our boots. The River Feshie was its usual impressive self, rushing down the glen in its ever-changing course. Soon the first big old pines appeared and the wild character of the upper glen began to establish itself. This is one of the few places in the Highlands that really has the same feel as wilderness forest areas in places like the High Sierra or the Rocky Mountains. Once we’d met up with Terry we decided to continue on up the glen, revelling in the wildness as we walked the narrow paths that cross the steep landslip prone slopes that run down into the river. The last ancient pinewoods lie in a narrow section of the glen where it is hemmed in by the steep rocky slopes of Creag na Gaibhre and Creag na Caillich. Here we camped, our five tents scattered amongst the big trees. There was little wind and the temperature was above freezing. Before dusk we wandered a little further up the glen watching the river and the trees and the crags. Then we sat under an old pine and chatted about the Cairngorms in Winter film and the outdoors in all its aspects. There was no wind and the temperature was around 5ºC so there was no need to retreat early to our tents. As we sat there the clouds cleared, a crescent moon hung in the sky and the stars shone bright with the constellation of Orion and the planet Jupiter standing out. By dawn the clouds had returned. The night had been warm - the low was only +1.5ºC - with just enough of a breeze to prevent condensation forming in the tents. We packed slowly, in between more talking, hot drinks and photographs, then set off back down the glen, finding less snow and more slush and mud underfoot as the thaw continued. Just briefly in the afternoon there was a hint of a clearance with patches of blue sky and touches of sunlight on the snowy hills. Back at the car park with a couple of hours of daylight left we decided to wander up the hills a little way. The path to Carn Ban Mor led through the regenerating forest to the boggy moorland above the trees. With no time for the high tops, which were anyway still cloud-capped, we left the path and headed for a lower top overlooking Glen Feshie. The going through heather, tussocks and slushy snow was quite tough. A little cairn decorated the 600 metre summit and there was a good view up Glen Feshie and across Strathspey to the Monadh Liath hills. There was a touch of winter up here too with a strong cold wind that saw hats and gloves and jackets appear. We descended directly down to the road, passing through a lovely old forest on the flanks of Creag Leathan. The two little pools in the narrow notch to the east of that summit were still frozen. The trip over we headed for Aviemore and a celebratory drink in the Cairngorm Hotel (coffee in my case as I was driving home afterwards). Thanks to Phil, Paul, John and Terry for a good two days. We made some progress on the film and in a few days I’ll be joining Terry again for more filming. The last two days has seen Highland Council reject proposals for three big wind farms that would have seriously damaged wild land in the Scottish Highlands. Clach Liath on the eastern flanks of Ben Wyvis; Dalnessie in the empty country north of Lairg in Sutherland and a major part of the view from Ben Klibreck; and Glenmorie to the north of Ben Wyvis would all industrialise a beautiful and wild part of the country. Highland Council doesn’t have the final say, unfortunately. This now lies with the Scottish Government Energy and Tourism Minister Fergus Ewing. Hopefully Mr Ewing will listen to his SNP colleagues on Highland Council who spoke powerfully in favour of wild land when rejecting the wind farms. The Council’s rejection of these wind farms has led to strong responses from many people and organisations concerned about protecting wild land. Chief Officer David Gibson of the Mountaineering Council of Scotland said in a press release that it was time for the Scottish Government to listen, change direction and implement a proper renewables planning policy to stop such proposals. 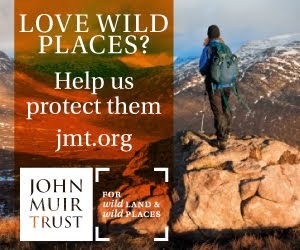 Fraser Wallace, Policy Officer of the John Muir Trust, said “there is now a groundswell of opposition to the industrialisation of wild Highland landscapes, embracing a broad spectrum of residents, communities, businesses, conservationists, the outdoors community and local politicians." Alan Sloman has commented in his usual forthright style on his blog and includes maps of the Clach Liath site. Backpackingbongos has a map of the Dalnessie wind farm on his blog and describes a backpacking trip in the area. There’s also a good heartfelt piece on the Benvironment blog. David Lintern in his Self powered blog doesn’t refer to these wind farms specifically but describes what it’s like to walk through a big wind farm – “this is as industrial a landscape as any inner city harbour area, shopping centre car park, retail park or breakers yard. But much, much bigger.” Having walked through a couple of wind farms myself I can only agree. David Lintern also describes eloquently the value of the habitats destroyed by these wind farms and calls for people to take action. Highland Council’s rejection of the three wind farms and the subsequent surge in news stories and interest is an opportunity to push for the protection of wild land, especially as the Scottish Parliament’s Public Petitions Committee is looking again at a petition for a new Wild Land designation to protect places of high scenic and wildlife value next Tuesday, 19 February (thanks to David Lintern for that information). 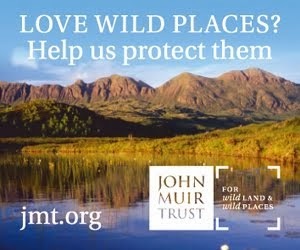 Contacting MSPs and the Scottish Government can be done via the John Muir Trust’s Wild Land Campaign page where there is a template letter plus details of how to find your MSPs and how to contact the Scottish Government. I urge everyone concerned with the future of the Scottish Highlands to send letters or emails, to your MSP if you’re in Scotland, to the Scottish Government if not. I think this is a crucial time. The Scottish Government needs to support Highland Council and reject these wind farms and we need to encourage them to do so. Let us hope they listen. 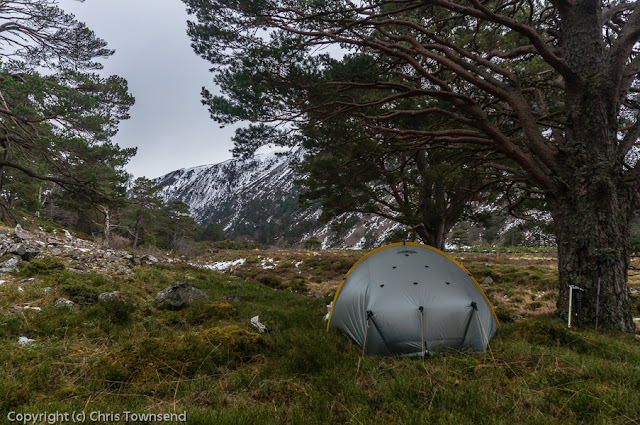 Terry Abraham is back in the Cairngorms filming for the Cairngorms in Winter video and is currently camped somewhere in Rothiemurchus Forest. He reports that he had a productive days filming though high winds kept him off the tops. Those winds look like increasing over the next two days with gusts of 85-90 mph at 900 metres forecast but then it should calm down. Snow is forecast for tomorrow, possibly heavy. I'll be joining Terry later in the week. If the forecast is correct we should be able to do some filming up high. Deep snow looks lovely, bringing a sense of freshness and rebirth to the land. Try walking in it and the beauty soon loses its lustre however. Once snow is more than ankle deep walking becomes hard work. Once it approaches knee deep progress slows to a crawl and every step is an effort. Walking a mile becomes an exhausting marathon. In the USA such ‘walking’ has the graphic and appropriate name of post-holing. I love snow. I hate post-holing. The answer of course is to stay on the surface or at least close to it, which means using snowshoes or skis. Suddenly moving becomes much easier and the snow can be enjoyed again. I first encountered snow like this many, many years ago in the Lake District on an astonishingly arduous ascent of Great End. 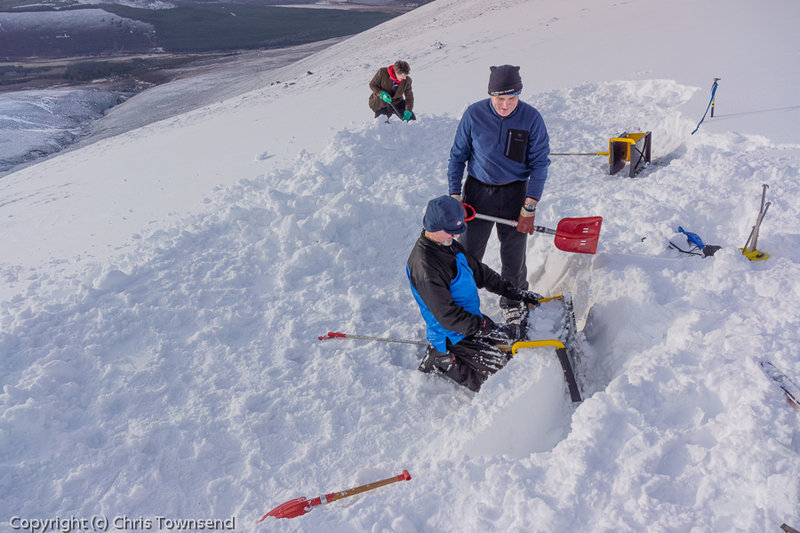 At times we were wading through seemingly bottomless thigh-deep snow. Continuing on to Scafell Pike was out of the question and it was with relief that we plunged back down our track, still stumbling and falling in the soft snow. Soon afterwards on a December trip to the Highlands I turned back on an ascent of Stob Coire Easain above Loch Treig due to snow that was thigh-deep in places. These were day walks. If I’d been backpacking I’d probably have never got far uphill at all. 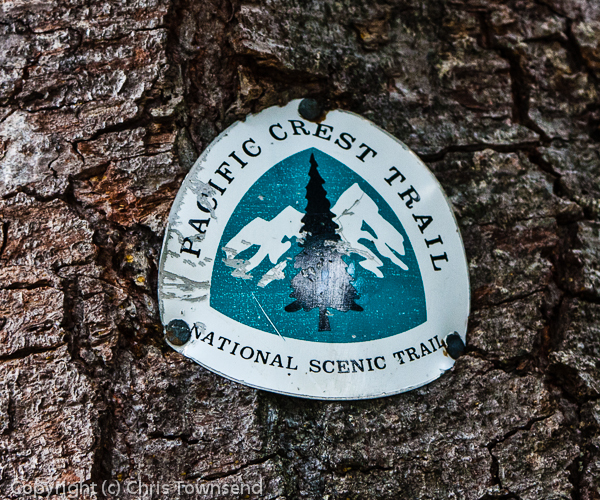 This was brought home to me a few years later on the Pacific Crest Trail, that great trail running from Mexico to Canada. There had been heavy snow that winter and spring and the mountain ranges the trail crosses in Southern California were all deep in snow. Struggling along their crests with a heavy pack was slow and tiring. However each range could be crossed in a day or so and the lower slopes were snow free so I was never ploughing through snow for long enough for it to be too gruelling. Up ahead though was the High Sierra, 500 miles of snowbound mountains, much of it above 10,000 feet. Post-holing that distance was unthinkable, and probably impossible. A hiker I met was using snowshoes and staying on top of snow that came up to my knees. Impressed I took a day off from the trail to buy a pair. Two other walkers joined up with us for the High Sierra section. They were using Nordic skis. Watching them glide across meadows and swoop down steep slopes while I plodded along behind them on my functional but slow snowshoes I suddenly understood that real skiing wasn’t being hauled up a slope by a metal contraption in order to slide back down but was a superb way to travel over snow-covered wild country. I vowed to learn how to ski and the very next winter I did so, courtesy of Cameron McNeish who was then working as a Nordic ski instructor. Once I could ski the freedom of snow-covered forests and hills opened up. Instead of fearing deep snow and hating the restriction it placed on my outdoor activities I relished it and looked forward to seeing the dark clouds piling in and the first thick white flakes falling on the brown land. Now it was a lack of snow that I disliked. My ideal conditions became ones where the snow is deep enough that I can ski from my front door. One of my favourite ski backpacking trips of recent years is when I did just that, skiing from home to the top of a nearby hill where I camped overnight. Since learning to ski I have done many ski backpacking trips from such overnights to two and three week long expeditions. For a decade I led such trips, taking groups on wilderness skiing and snow camping trips in remote places like Svalbard, Greenland and the Yukon Territory. Many of these trips, whether as group leader, with friends or solo, are amongst the most memorable I have ever undertaken. The landscape changes dramatically under deep snow. Wild places become wilder. Tamed and half-tamed places shake off some of the controls and start to revert to wildness. Everywhere becomes vaster and more magnificent. Being able to travel easily through a snow-covered land means it can be appreciated fully. It’s hard to delight in beauty when you’re soaked in sweat, your legs are throbbing with pain and you’re plunging in knee deep with every step. Gliding over the snow on skis is a totally different experience that feels natural and in tune with the white wilderness. The ultimate way to enjoy the snow is to stay out night after night, either in a tent or a snow shelter. Skiing with a big pack may seem challenging but with a stable load (skiing is a good way to find out just how secure a pack is) it’s not as difficult as it might seem. However snow provides an option unavailable for much of the year and that is to pull the load on a sled. On reasonably gentle terrain this is much easier than carrying it on your back. Skiing steep slopes with sleds does require some practice. Downhill isn’t too difficult as long as the slope is wide as the sled actually helps with balance – though in trees life can be exciting if the sled decides to wrap itself round one. Steep ascents are the real difficulty as sleds tug you backwards or slip sideways on rising traverses. It’s still easier than post-holing with a big pack though. Much more can be comfortably hauled than carried too. Two weeks food is a burden in a pack but no problem with a sled. The thought of the snow swishing under my skis and the mountains sparkling, fresh and newly clad in white brightness fills me with excitement and delight. 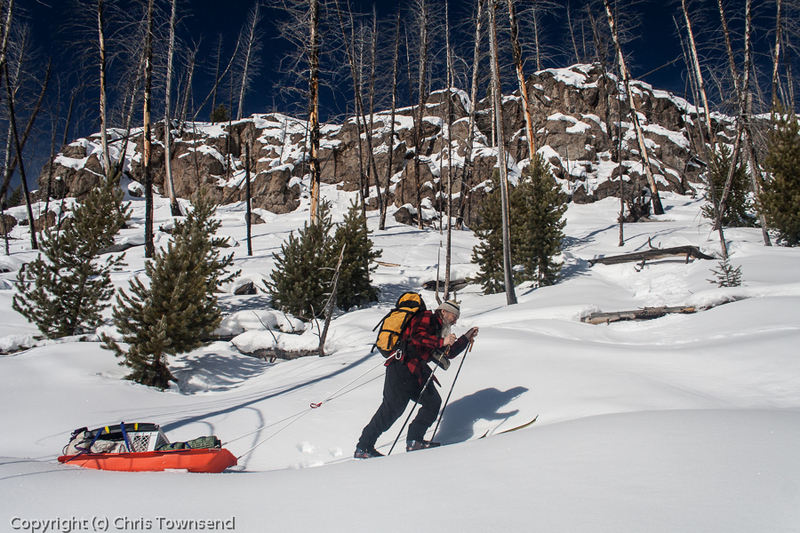 This is the time of year for ski backpacking. 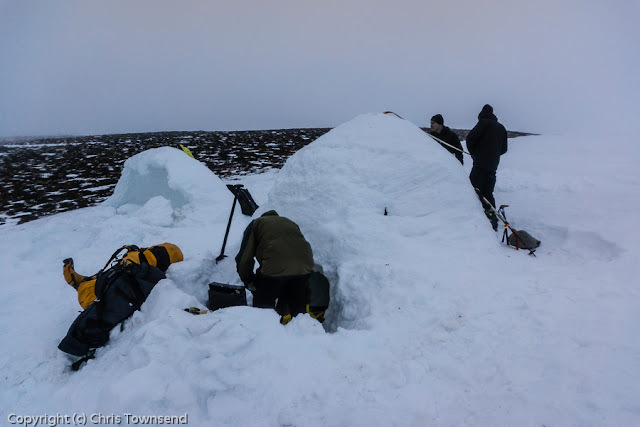 The return of the snow and colder temperatures meant it was time for another igloo trip, this time with Andy, Mike and Roy from the Inverness Backcountry Snowsports Club. We met in Glen Feshie and headed up into Coire Fhearnagan. The hills ringing in the corrie were pleasantly white, the cloud-dappled sky was blue and there was little wind. Soon the snow was deep enough for skis. Although the weather was calm and the sky was clearing we knew the forecast for the next day was stormy with strong winds and warmer temperatures so we wanted to build our igloos (we’d decided on two small ones rather than one big one – a decision that was to prove important) this side of the summit of Carn Ban Mor. That way we’d have a relatively easy descent the next day if the weather was really bad. This would also prove to be a sensible decision. 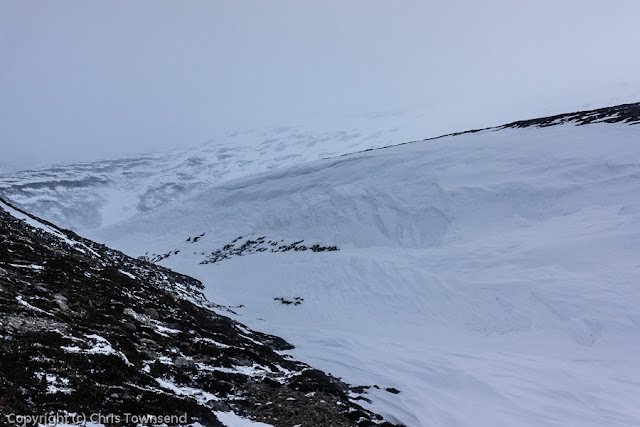 At around 750 metres a wide shallow gully running south into the corrie looked promisingly packed with snow. Prodding with ski poles showed it to be several feet deep. We’d found our igloo site. The angle meant we had to dig out platforms for the igloos before we could start actually building them. The temperature was -2.5ºC but the effort of shovelling in the still air meant we were soon removing clothing rather than donning it. As darkness fell a south-west wind began to blow, whipping up spindrift. The igloos grew and soon the tops were closed and doors dug, deep doors below floor level. The spindrift still blew in so the openings needed blocking with groundsheets, Iceboxes and packs. In our igloo Mike and I lay in our sleeping bags talking about long walks, outdoor writing and writers, conservation and more. All seemed warm and comfortable. Finally we decided it was time for sleep. I had almost dozed off when I felt spindrift on my face. I could feel wind lifting the foot of my sleeping bag too. Puzzled I switched on my headlamp. There was a hole in the wall next to the door, a hole that was growing rapidly. As it did more and more spindrift rushed in, covering our gear. Staying here was clearly not a good idea. Important decisions needed to be made and made quickly as the situation was rapidly worsening. 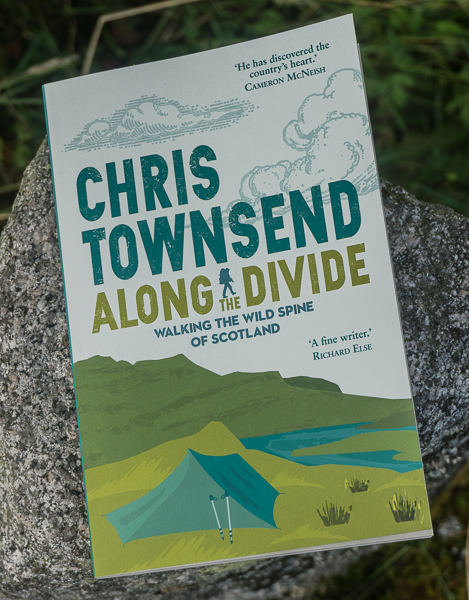 When something like this happens companions are important and I couldn’t have had a better one, Mike being Mike Cawthorne, author of Hell of a Journey, an account of a winter walk over all the 1,000 metre peaks in the Highlands, and a very experienced hill walker. We very quickly agreed on a plan. 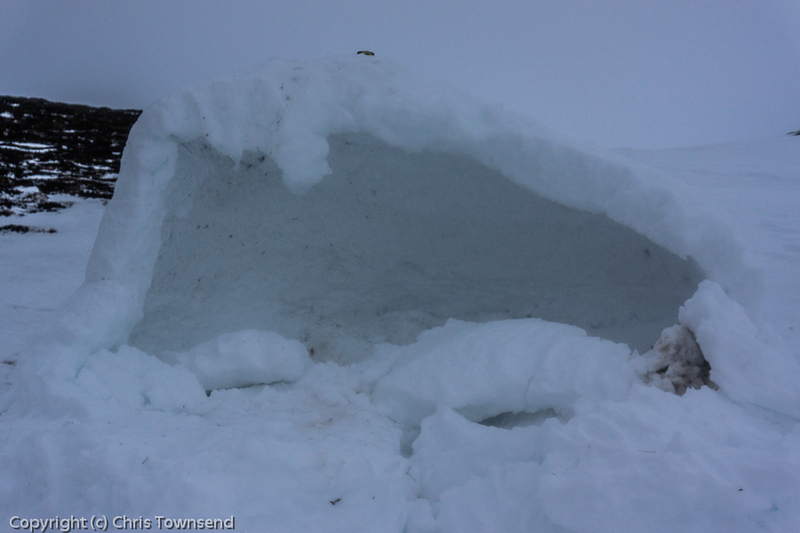 Get dressed, pack up, dig around for buried gear, then see if the next door igloo was still in one piece. If it was we’d crawl in, if not we’d have to descend. The next period of time – half an hour, an hour, longer, I really don’t know – was frantic yet controlled. Emptying snow out of boots, prising frozen clothing apart and shaking off the snow, shivering as the spindrift inside melted then, when dressed, fumbling with wet gloves at half-buried gear and stuffing it into packs any way possible. And all the time the hole in the wall grew and more spindrift poured in and the wind roared. Finally we were ready to leave, which was done more easily through the wall than the door. Outside in the blackness the wind nearly knocked me over (the Cairngorm Weather Station recorded a gust of 98mph that night). I staggered over to the other igloo, which looked intact. Shoving the door aside I crawled in and woke the others. Again, your companions are important at times like this. Andy and Roy didn’t hesitate but immediately began to make room and to work out how four of us could squeeze inside and lie down. Soon we were organised if cramped and could try and get a few hours sleep. My sleeping bag was damp but not so wet that it didn’t keep me warm, though I did keep my down jacket on (and was pleased it was one with the new water-resistant down – although quite wet this kept most of its thickness and warmth). Mike’s sleeping bag had suffered more and he had a few chilly hours. Come daylight and we could see small holes in this igloo, holes that were slowly growing. There was a slight sag in the wall just above Mike’s head too. Venturing outside we were startled to see that there had been a big thaw. We’d be carrying the skis down. Almost half the abandoned igloo had collapsed. The remaining section was surprisingly hard. 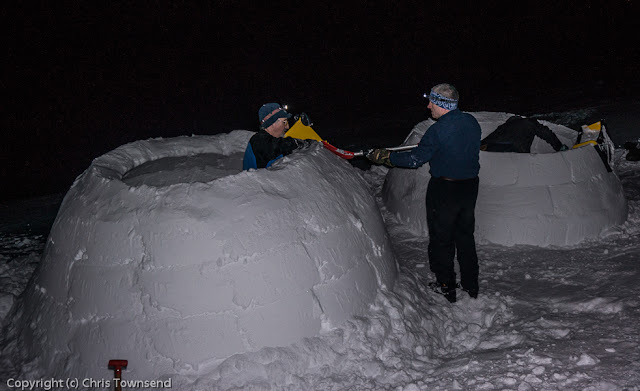 We reckoned the thaw and the abrasion of wind-blown spindrift on the igloos, whose blocks had not had time to set up hard and ice up, were the cause of the problems. After a hot drink we packed up, wanting to get out of this igloo before it too became uninhabitable, and walked back down to Glen Feshie, glad that we’d stayed on that side of the hill as we were now quite tired. The wind eased, rain fell and in the glen it didn’t feel like winter. We drove to Aviemore and settled into the Active Cafaidh for a very welcome and excellent late breakfast. Every outdoor trip teaches something, though it can be hard to work out just what that is. There was no doubt in this case though. If there’s likely to be a thaw don’t rely on an igloo for shelter. The thaw lasted less than 24 hours. Now the snow has returned and everything is white again. The Mach issue is out now. In my backpacking column I look at the creation, development and maintenance of long distance trails from the Pennine Way to the Appalachian Trail. On almost all the long distance walks I've done I've carried a down sleeping bag and on many down clothing as well. Recently there have been questions about the ethics of down production that have had me, and I'm sure many others, wondering about using it. Down also has the problem of not performing well when wet. I looked at both these topics for an article on down and discovered that many companies are now taking the ethical question seriously and that the use of water-resistant down is increasing. I was already impressed with water-resistant down when I wrote the article. I'm even more pleased with it now, having just returned from a ski and igloo trip that suffered somewhat from a rapid thaw (of which more in my next post) and during which my water-resistant down jacket became very wet but still kept me warm. Also in the gear section I review 15 packs in the 25-35 litre range while Daniel Neilson looks at four GPS watches. 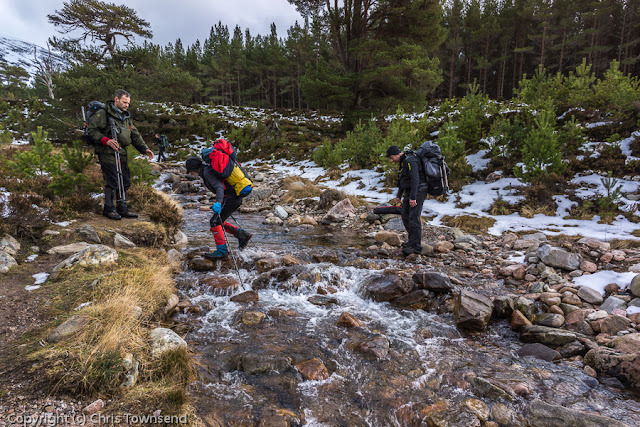 Daniel also reviews the Arc'teryx Alpha SV Gore-Tex jacket and Cameron McNeish has a look at the Yaktrax Pro Ice Traction devices and the Montane Nitro down jacket. Elsewhere this issue includes Dan Bailey's selection of eight winter ridge walks, which range from the Riggindale Ridge on High Street in the Lake District to Tower Ridge on Ben Nevis, a grade 111/1V climb. Cameron McNeish visits Norway and discusses its hut system and the country's outdoor life philosophy. Carey Davies wanders along the rather snowless for winter Grey Corries and then finally finds a use for ice axe and crampons on the indoor ice wall of the Ice Factor in Kinlochleven. Roger Smith writes about the Honister zip wire controversy in the Lake District and calls for tighter restrictions on developments to protect places like the Lakes. Jim Perrin's book this month is Barry Lopez's Crossing Open Ground, a book I haven't read, though I have read Lopez's wonderful Arctic Dreams. The Hill Skills section has an informative piece by Glenmore Lodge's Chief Instructor Ian Sherrington on avalanches, an important topic at present, especially in the Highlands where there have already been several avalanche accidents this winter. Also covered are scrambling, navigating by the sun and how mountains affect the wind. A week of storms. The wind raging through the trees, round the house, rattling in the chimneys. Rain hammering down out of hard, grey, streaming clouds. The air chill and penetrating. The downside of a Scottish winter, dreich and dreary. The ground matched the air in chaos and wild disruption, littered with fallen twigs and cones and branches and churned to a soggy mess by a slow thaw, the slushy snow and dissolving ice mixing with the soil to create a slick and slimy mud. Walking has been unpleasant, blown sideways by the wind and slithering unsteadily on the unstable, uncertain ground. Then finally came silence as the wind faded away. The rain still fell, the sky was still dark, but the quiet brought calmness, a chance to pause and take breath, to look round at the world without the disturbance of gales thrashing the air. Nature was still, the incessant, agitated, storm-driven twitching and shaking had gone. 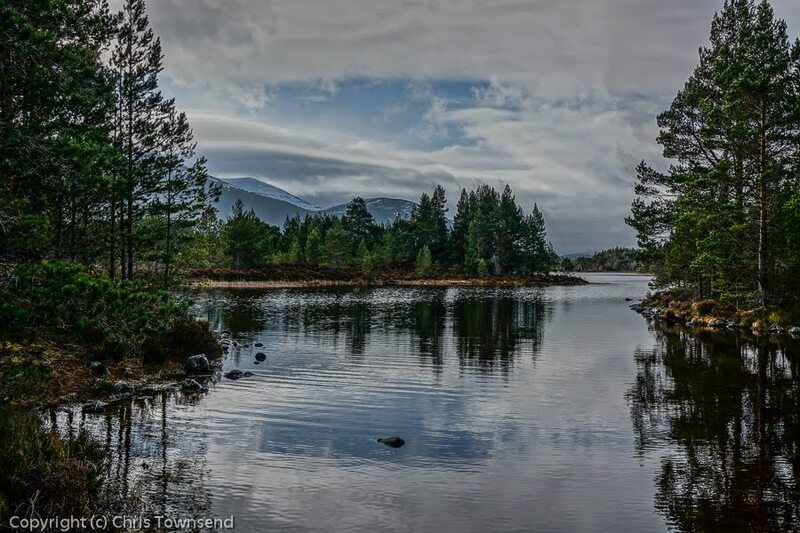 The tops still being cloud-shrouded I walked in the old forest around Loch an Eilein and Loch Gamnha, relaxing in the peace below the green pines and pale birches. The rain dimpled the surface of the water but fell without sound, straight down in a gentle, thin, sheet. My mood changed with the weather, and I relaxed and shed the somewhat frenetic tenseness engendered by days of roaring wind. Briefly the rain ceased and a weak sun shone through thinning clouds. Colour appeared in the water and the reeds and the fading, broken-stalked, rusty last year’s bracken. I encountered two acquaintances, briefly met sometime in the past. We stood in the trees and talked of mountains and long walks and ski tours and conservation. I know them better now. The air was still and warm and dry enough that though the last day of January I didn’t feel cold standing there in the woods. 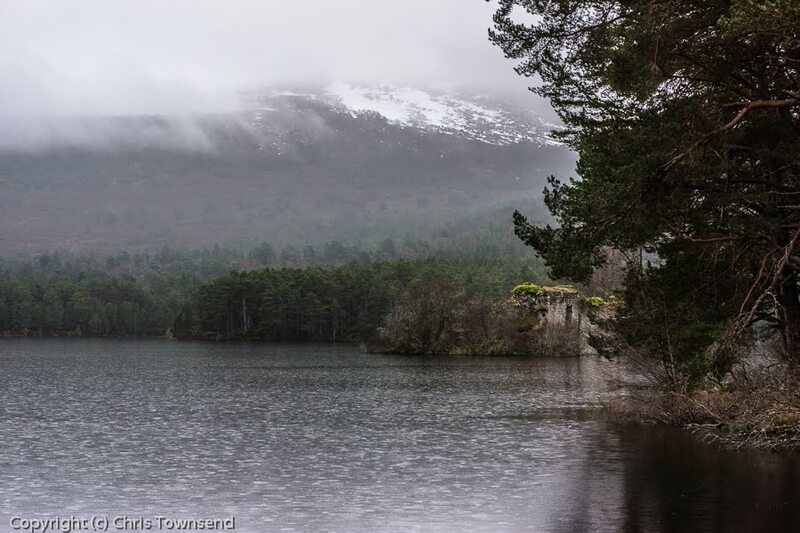 As I moved on the rain returned and a slight breeze rippled the surface of the loch. High above I caught a glimpse of ragged edges of remnant snow patches on the mountainsides. The air is cooling now. The next storms will bring snow. Soon it will be skis and igloos again.